is out!! My new book, New House … New Address was published 27th July 2018! 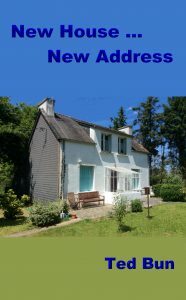 The follow up to my best selling book, New House … New Neighbours, continues the story of Fran and Jerry’s New Life in France, with their New Neighbours, in their New Community while enjoying skinny dipping! Available in Paperback, and for Kindle – free with Kindle Unlimited. Read, Enjoy, Review …. pretty please! !